While the label Oyster Perpetual is applicable to all modern Rolex watches (except for the Cellini line) it’s also the name of a specific Rolex collection. This is where some confusion may arise. All contemporary Rolex watches are essentially Oyster Perpetual—that is, waterproof and automatic—yet, there are the Oyster Perpetual watch models too. The Oyster Perpetual watch is Rolex’s entry level model. Exclusively constructed in stainless steel, it is the most affordable option among the brand’s current catalog. Moreover, it’s a time-only Rolex watch—no date or any other extra functions. However, despite their simplicity, OP models are still luxury Rolex watches through and through. There’s the top of the line 904L steel, the famous water resistance to 330 feet, an in-house automatic mechanical movement, sapphire crystal, and of course, the Rolex name. Here we take a look three different references (and sizes) of current Oyster Perpetual watches. The Rolex ref. 114200 is the 34mm version of the Oyster Perpetual. On the face of this watch, we see the 3, 6, and 9 Arabic numerals alongside luminescent baton hour markers. The mix of numerals and sticks is a design we also see on some Air-King models as well as, Explorer watches. The Rolex ref. 114200 is the 34mm version of the Oyster Perpetual. The ref. 114200 runs on the Rolex Caliber 3130 perpetual mechanical movement. Newer versions of this time-only in-house caliber is equipped with the Parachrom hairspring for optimal resistance to shocks and temperature changes. It operates at 28,000 beats per hour and offers the wearer 48 hours of power reserve. And identical to all modern Rolex watches, the Caliber 3130 is a chronometer, certified by COSC. Slightly larger, the case of the Oyster Perpetual ref. 116000 measures 36mm. A favorite size of the brand, so many Rolex collections sport the 36mm case including the Datejust, Day-Date, and older Air-King and Explorer 1 models. Truly a unisex size, the ref. 116000 looks great on both men and women’s wrists. 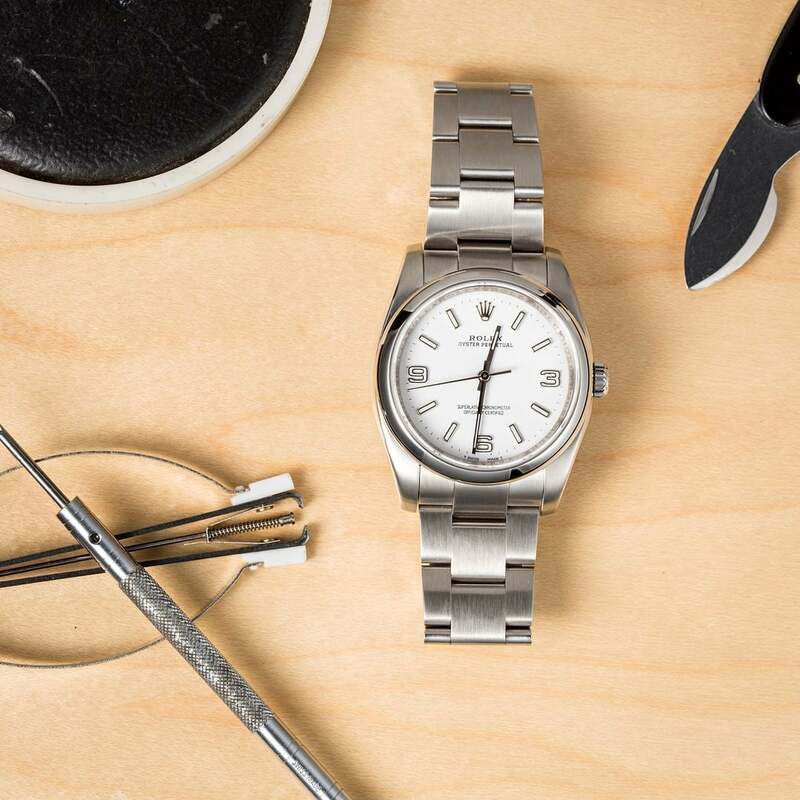 The Datejust, Day-Date, and older Air-King and Explorer 1 models can come in 36mm case sizes. There’s a slew of dial options available on the ref. 116000: the 3,6,9 layout similar to the above ref. 114200, the all-stick index layout, and even concentric patterns marked with large minute markers. The most current version of the Oyster Perpetual ref. 116000 boast colorful sunburst dials such as red grape, white grape, and vibrant blue. The ref. 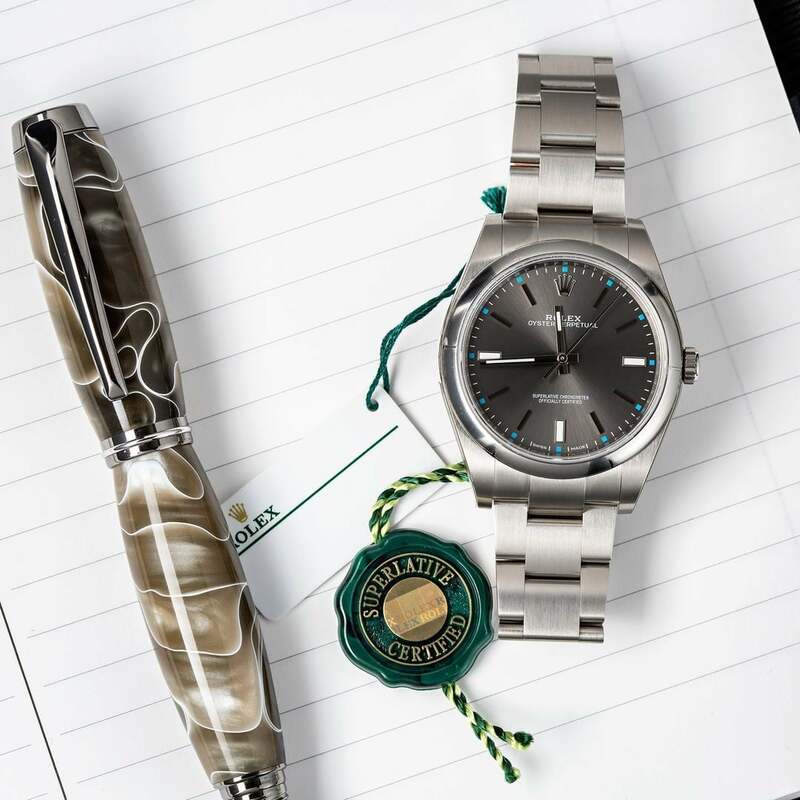 114300 is the newest version of the Rolex Oyster Perpetual. With its very wearable 39mm size and colorful sunburst dials, it’s become a favorite option for an entry-level Rolex. In fact, it’s been labeled as the only watch you’ll ever need on several occasion. Furthermore, it sits at a very attractive price point—particularly in the secondary market. For less than $5,000, you can get your hands on a fuss-free contemporary Rolex watch that’s superbly designed. This is a very wearable 39mm size and colorful sunburst dials. Powering the Rolex OP ref. 114300 is the Caliber 3132 in-house automatic movement. Again, this is a time-only perpetual caliber. Also operating at 28,000 beats per hour with a power reserve of 48 hours, the 3132 has both the Parachrom hairspring and Paraflex shock absorbers. These mechanisms amp up the robustness of the movement to keep up with daily wear and tear. For those who appreciate luxury watches with a minimalist aesthetic, Rolex Oyster Perpetual watches certainly fit the bill. 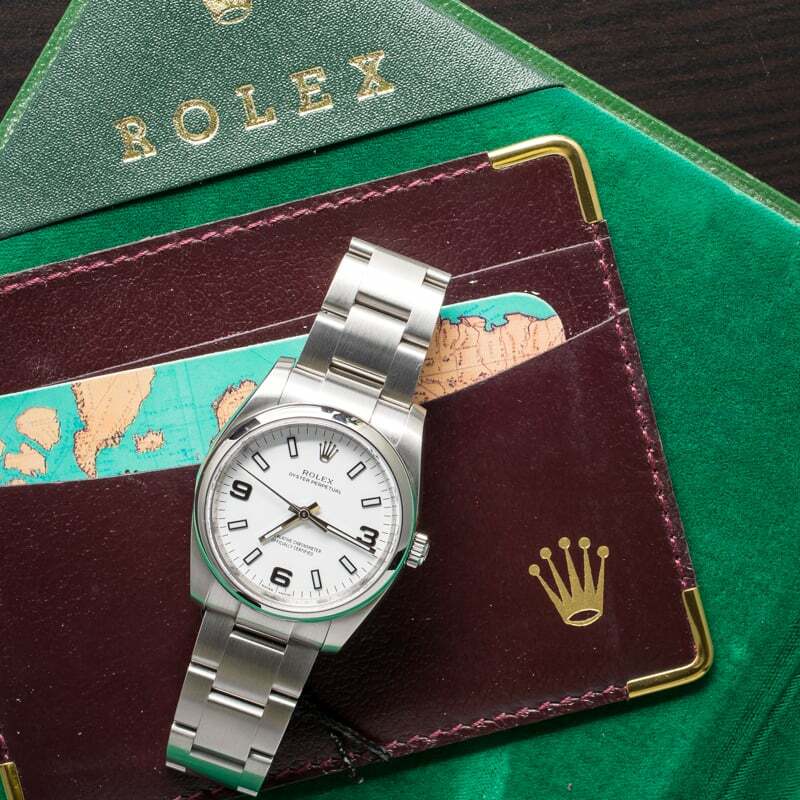 Not only do they offer the precision, accuracy, and high-quality associated with the famous Swiss watchmaker but also, design hallmarks that are instantly recognizable as Rolex. Whether you’re looking for a more affordable Rolex watch or a straightforward top-tier timepiece, take your pick from the vast choice of Oyster Perpetual models.